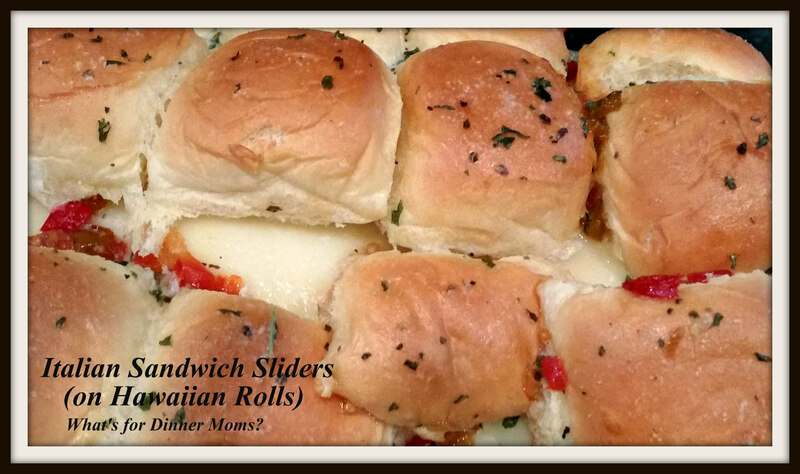 Italian Sandwich Sliders (on Hawaiian Rolls) – What's for Dinner Moms? I am going to be posting lots of foods you can use for football parties or for a hearty appetizer dinner. As I have said before my family loves these little Hawaiian rolls sandwiches, if you don’t like the sweetness of the rolls you can always substitute a nice package of heat and serve dinner rolls. I am continually looking for new combinations of meats, cheeses, and toppings to try. These are very filling and would make something a bit different for a main dish rather than pulled pork sandwiches or chili. Maybe a nice hearty chicken soup would complement these sandwiches. 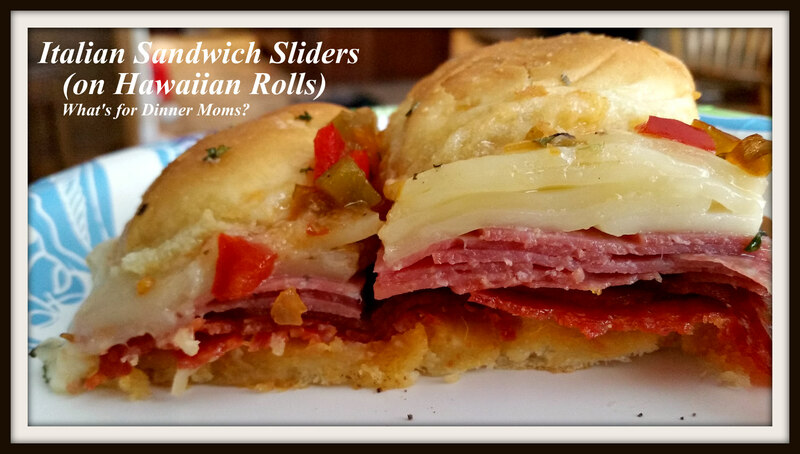 You know my family loves these little sandwiches but these are one of our favorites next to the Reuben Style Hawaiian Slider Sandwiches (click for link to post). The sweet red pepper jelly was the part that really put them over the top. They had a great vinegary/sweet taste that balanced out the pepperoni and salami. They are super hearty and each one of us had two sandwiches as a hearty entree. The leftovers were quickly claimed for lunch the next day. Serve these with an Italian anitpasti salad or hearty green salad on the side and they make a perfect football party or buffet appetizer meal! Slice tops from rolls horizontally and place bottoms in a 13″ x 9″ casserole dish. Layer pepperoni, salami, and cheese over roll bottoms. Spread red pepper jelly over the sliced side of the roll tops. Add tops to rolls in pan. Mix melted butter, basil, garlic, and onion powder in a small bowl. Brush over tops of rolls. Bake rolls for 10-12 minutes until rolls are browned and cheese has melted. Pretty sure that they are really yummy! I live hoe,easy they are and everyone loves them! I love Hawaiian rolls, so this would be a real treat for me. Thank you, Marci! Thank you, Sylvester! They are delicious! Thank you for all your comments and support! Oh, yum! Great idea, Marci! Btw. I am often cooking dishes from your recipes. Another one tomorrow! Thank you! I hope you take them and make them just the way your family likes! Yes, I varied some recipes but only little details. Your suggestions are already great! My family and I love Hawaian rolls. The 24 roll pack lasts 2 days in our house. My kids would fit right in with you! They love those rolls! Yum yum! I agree with everyone else! I will have to try these, too! Thank you! We loved the sweet pepper jelly on them. These sound and look absolutely delicious.